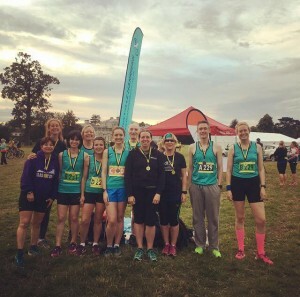 Lesley Pymm reports: At last we have been able to run the Shugborough Relays. This event was postponed a couple of weeks ago owing to the state of the ground after another event had taken place and there had been lots of rain. It was not considered safe for the relays to take place and would not have done the Shugborough grounds a lot of good! Expecting the M6 to be the usual disaster that we have come to know and hate, I set off really early – and it was clear!! Got there way before the flag that was coming with Jude, so stood at our ‘pitch’ in my teal vest. Gradually the teal team trickled in and I was able to hand out numbers and chips – yes, electronic timing for a run that was advertised as 2 miles. In fact it turned out to be more like 2.28 miles owing to the fact that another event is to be held there at the weekend and their marquee was pitched on our course. There was a slight course adjustment. You can imagine my relief when the whole squad was there early, fit and ready to run! We had 3 teams in the event – and were very pleased to welcome 2 ‘guest’ runners. It was that sort of event! Ex-member Hilary Foster volunteered to run when I put out a plea after some of those who had originally been entered were unable to make the re-arranged date. Mike Tracy (my husband) made the mistake of saying: ‘I could do that’, when I was bemoaning the fact that I couldn’t get enough runners for the two miles. Thank you to everyone – I do appreciate that Shugborough is not always easy to get to from Birmingham at that time of day, and that, especially if you are working, it is hard to get away early enough to avoid the traffic. The course was a mixture. It started off on newly cut grass and was a bit difficult underfoot. After that there was tarmac, woodland paths and more grass. We wound round the grounds and passed the house, over little bridges, past interesting looking boards telling visitors about the cattle that they keep there (no, I didn’t stop to read them) and eventually a downhill finish where some people managed to get a good sprint going. Some of the youngsters were amazing. The future of our sport is looking good! This is very much a social/fun event. There are odd categories for the teams and you can end up with an eighty year old being in the same team as a 7 year old if you work it out right! There are obviously many entries from clubs, but also family teams, work groups and other combinations. Watching the first leg go off was amazing – I hadn’t realized quite how many teams had entered until I saw the mass of people set off. Everyone seemed to enjoy it and hopefully we can get even more teams out next year! The results are not up yet, but should be there soon. Bryan Dale took photos but they are also not yet ready as he has been very busy and is at another race tonight. Keep an eye on his website. This entry was posted in Multi-terrain, Race Reports, Relays by Race Reports. Bookmark the permalink. Congratulations Lesley. Your enthusiasm,persistence and hard work came to fruition. I`ve viewed some of the photographs and perused the Results —— Clearly the Shugborough Relays 2016 were a great success. This may well become an annual event on BvH`s Fixtures. Congratulations to all concerned. Such an event,notwithstanding the challenges facing the Race Director and his /her Team,underlines the fact that performance,partricipation,encouragement and enjoyment are important components in running`s raison d`etre . GO TEAM TEAL,GO,GO,GO —- GO.